Looking out from my balcony on the fifth floor of the LUX* Bodrum Resort & Residences it is easy to see what people love about this part of Turkey. Once home to a fly-and-flop mass tourism industry, the region has grown to become something altogether more sophisticated in recent years. But one thing that has not changed is the stunning scenery. With the Aegean Sea glistening in front of me, it is possible to make out the hazy shapes of the Latmos mountains in the distance – a little slice of paradise. Perfect for hiking, adventure sports or simple sightseeing, the mountains frame the peninsular, a haven for relaxation on the southern coast of the country. The sound of families playing on the private beach drifts up on the wind. 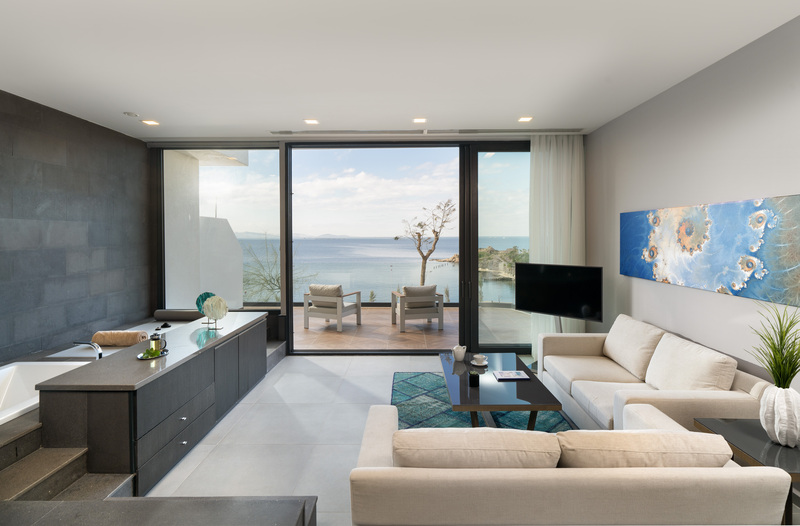 Below the 91 guest rooms and 19 private residences that make up this sleek, modern property are piled onto the steep cliffs like so many artfully arranged Lego bricks. Stark shapes jut out in all directions, pointing toward the sky, over the sea, or back in land over the private outcrop which houses the resort. Focus has been given to creating the utmost comfort for guests without disturbing the area’s natural beauty, with local materials, fine Turkish craftsmanship and authentic local accents all employed. 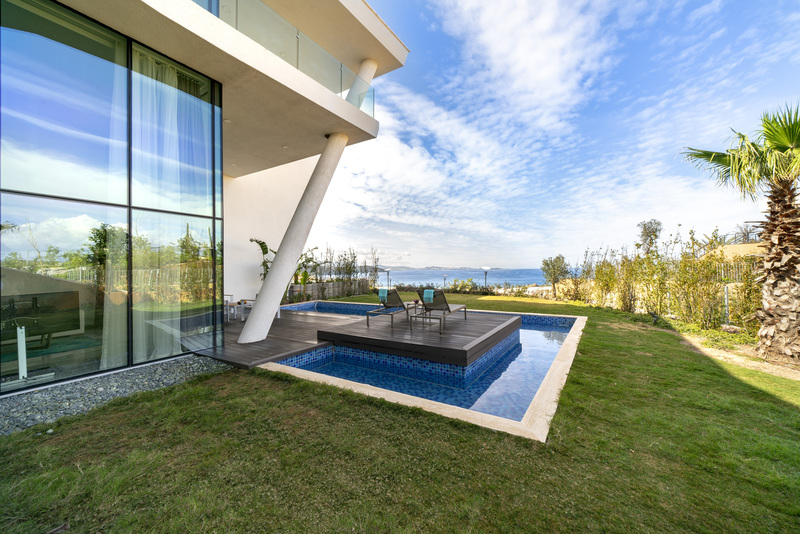 LUX* Bodrum has already won international recognition for its architecture, and it is easy to see why. Set in an area of pine-clad hills dotted with sugar-cube homes, it brings a modern flourish to this most traditional of landscapes. When I visited earlier this month, the property was comfortably full, welcoming guests from Russia, Ukraine, the Middle East and even the occasional Brit. The emphasis was very much on family, with the calm seafront filled with children enjoying the cool waters. For our short stay we were accommodated in a Sea Front Room. While not the largest, it had everything we needed for a break. Decorated in stark white and combining contemporary design with residential levels of comfort, it prominently featured a flat-screen television, working desk, and a raft of amenities, as well as that great balcony. 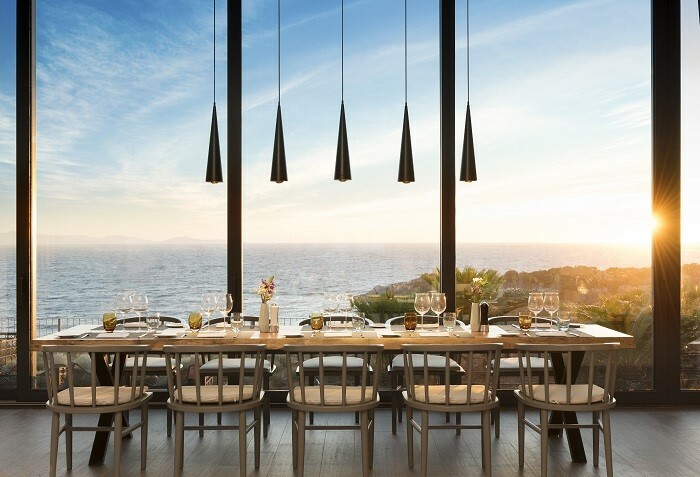 The floor-to-ceiling windows flooded the space with natural light while offering panoramas of the Aegean Sea. 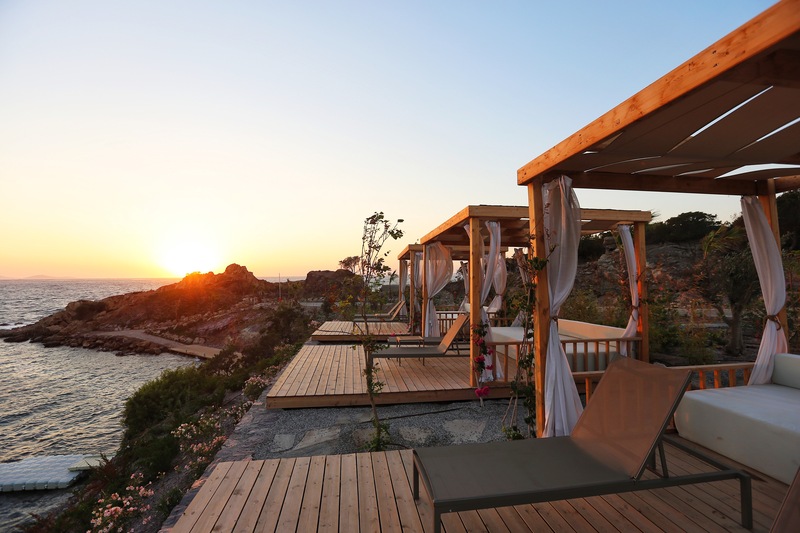 But LUX* Bodrum is not really about the rooms. For those who feel sociable, Beach Rouge is as atmospheric at lunch as it is for late-night cocktails, the perfect place to grab a drink and watch the sun set – or come up! After taking your front row seats for sunset, DJ’s and mixologists kick things up a gear with the perfect star-lit soundtrack to accompany bites and cocktails, plus pop-up experiences and more than a few surprises. On the fine-dining side there is Stella*, offering an Italian gastronomic experience created by executive chef, Baris Torcu. Perched on the edge of the cliff, the location provides breathtaking views of the secluded bay. Serving an open buffet breakfast in the morning, the place really comes into its own for an a la carte dinner. With a commitment to showcasing the bounty of Turkey, the restaurant has forged partnerships with regional suppliers, ensuring fresh fish, meats, vegetables, fruits and olive oils are all sourced locally. This includes pastramis and cured meats from Kastamonu - the finest in Turkey. The work has paid off and the large outdoor terrace encourages Stella* encourages guests to relax, interact and enjoy a well-earned rest. Lux* Bodrum is home to an impressive infinity pool, which can get quite busy, while the LUX* Me spa not only offers the expected line-up of pampering treatments, but also a selection of traditional medicine and wellness programs. The aim here is tune guests into nature, providing everything they need to reinvigorate. A comprehensive line-up of fitness facilities is also on offer, while the expert care of therapists affords the opportunity to maintain any regime while on holiday. For those really looking to take the plunge, Estethica clinic is heavily advertised throughout the property, offering everything from bloodletting and leech treatments, to plastic surgery, hair replacement therapies and dental work – it really could be time for a whole new you! Outside of the resort, hidden beaches and crystalline waters call for a little bay-hopping aboard a traditional gulet. The LUX* boat ferries a select few along the coast, taking in sites it would otherwise be impossible to reach. There are also ancient Greek and Roman relics and cultural experiences nearby, encouraging guests to explore the history of the region. The town of Bodrum itself is about a 45-minute drive away, along a winding mountain road. Very much a resort town, it is packed with dozens of bars, pubs and clubs along a remarkably clean waterfront. We ducked into several of the airconditioned bars along the main strip, many of which offered direct access to the sea from elevated platforms. Cocktails are imaginative, the service friendly and prices are heading downwards along with the value of the Turkish lira. If you have time, there is also the Bodrum Museum of Underwater Archaeology to explore. Situated within Bodrum Castle – built from Knights of St John from the 15th century onwards – it is a one-of-a-kind attraction, showcasing artefacts from ancient shipwrecks. A nice cultural flourish to add depth to the destination. LUX* Bodrum is also only a few kilometres from Lake Tuzla, which is the meeting point of thousands of migratory birds, including flamingos, while Güvercinlik, a beautiful fishing village with small restaurants, is only a short drive.